So, you know I love a good handbag and you might already be thinking Sure Sarika, another handbag? and But I'm still saving up for my Gucci. But just hear me out, because in my opinion emerging brand Illicia has more to offer the discerning buyer than your average designer luxury brand. For me this range has everything that I look for in an investment piece: to be of the highest quality, transitional, timeless and outside the mainstream. To be effortless, practical, to work with any look and to basically age with me. And for these demands the Illicia designs are a heavy-weight contender. The Illicia mantra is all about individuality and empowerment, which I absolutely love; it's a bag for the woman, not a woman for the bag. We are constantly inundated with trends to buy into and as the popularity for luxury handbags seems to be at melting point, identifying with a product which is less about reaching blogger-status and is more about individual needs and self-expression, is definitely something that I can get behind. It is what I strive for every time I introduce something new in to my wardrobe, after all. Launched in 2015 by Ilham Mohamed, all the pieces are designed in London and then handmade in Italy. Although they are relative newcomers to the luxury scene they already seem to have a clear vision of what they want the brand to represent and who the Illicia wearer is. A big part of the Illicia bag range is their interchangeable handle feature, allowing the wearer to customise and update their bag. Immaculately crafted and so neatly designed, this extra option allows a pleasing element of personalisation and the option to renew and switch up as needed. Illicia invited me to take their namesake and a few of their signature handles out for a spin to road test and of course I was only too happy to oblige! 1 bag, 1 day, 3 looks? Challenge accepted! I started my day with a pair of classic black woven handles. Paired with my black long-line 1950's coat to keep the early morning chill away. I love how the understated gold hardware glitters and pops against the black; the kind of look that says: I was at the office, but I've taken a half day and now I'm having spontaneous cocktails with friends at 4pm on a Thursday...or something. 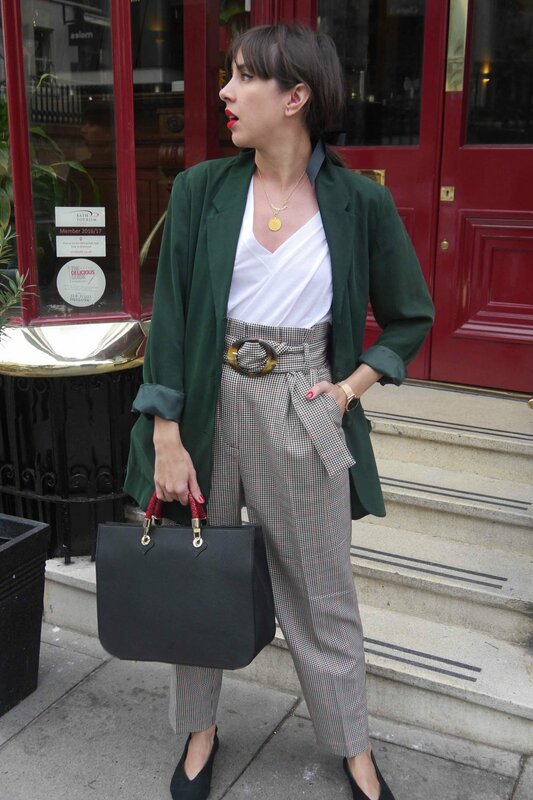 After going for a coffee, the day warmed up and I was officially in weekend mode so I switched things up with a beautiful pair of tri-colour handles, set aside the formal coat and went for something a little more casual but still put-together. Perfect for a stroll around the city and some sightseeing. The last stop for the day was a romantic dinner date at my favourite Italian (with my favourite English!) so I slipped on a vintage silk blazer and popped on a red lip. With just a few satisfying clicks I had adjusted my bag again, this time with these stunning handles (cardinal red) to match the look perfectly. In reality I wouldn't expect to take several handles out with me in one day and although I kept the wardrobe changes minimal it was great to test out the concept and see how practical it was to carry around on a realistic day out - not just looking pretty in a picture (that's the easy bit!). The beautiful understated details really impressed me and I loved how deceptively practical it felt, with useful internal compartments concealed inside the smooth, unassuming external design. Large enough to use for a day at the office - easily fitting devices and essentials - while still retaining a relaxed understated flavour, transitioning to days off and evenings out effortlessly. (Here I am coordinating with my fave lasagne establishment. That might've been an honest coincidence...and it might not). So you love the bag, but there is even more good news to tell you about the brand (see, I told you). The Illicia campaign 'Your Choice, Her Opportunity' is a program whereby 2% of the proceeds of every handbag sold go towards helping a woman in the developing world establish her own business. Such an exciting, innovative concept on so many levels; aiding women to be their own masters and take charge of their own visions. This can only lead to further innovation as these efforts come to fruition, having further impacts socially, economically and creatively - just another reason to love Illicia! Now, I'm off to get some arancini, Ciao!